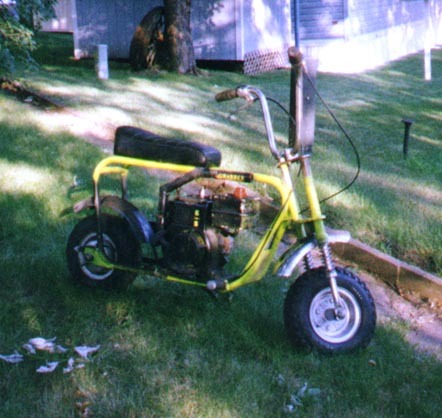 Shown here is a late 60's to early 70's Chibi mini bike. The product and company is Tonaka. 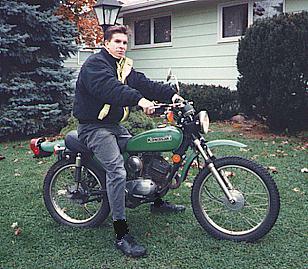 They purchased the tooling for some Bridgestone motorcycles from Rockford in the1960's. Rockford was in financial distress relative to mc production/sales. Tanaka manufactured the bikes in identical fashion and marketed them under the Taka, Tora and Chibi model names. Parts from these bikes would be the same. Here is the only other photo I have of the Tonaka built, deluxe version of the Chibi. 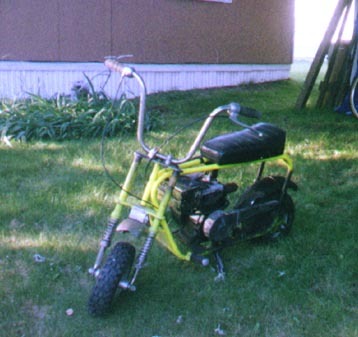 If someone out there has any additional info/pics/articles for teh Rockford/Tonaka mini-bike, PLEASE contact me. Turns out it only cost me $20 from an older friend where it was just sitting for years, waiting for a young fellow like me to nab it. It is a Mini Trail Rider by Husky. It was manufactured by TSC industries located in Richland Center, Wisconsin, only 60 miles from my home town. It originally was orange in color and powered by a (white) Techumseh 3hp engine. I had it dialed in to idle real low yet deliver max hp climbing slow grade roads. I replaced the stock muffler with a 5" threaded plumbing pipe. I drilled a few holes towards the end of the pipe to give it a novel, machine gun look. One day, I was working the engine quite well up a frequently ridden road when up at the top, as I let off the gas, the engine seized on me. Being it is a centrifugal clutch, I just coasted to a stop. I didn't know what happened. I tried pull-starting it again but noticed a distinct solid resistance. I gently pulled it some more and it then spun freely. Zero compression! I coasted it down the hill and later took the engine apart. Lying in the bottom of the case was little tiny teeth from the cam gear. Weird how the cam gear fatigued. Anyway, my Grandfather had this OLD Briggs engine lying around. $15 and it was mine. It was originally black (now repainted) and still has the original gold B/S model sticker on the flywheel cover. It is a late 50's model. That was and still is a finer engine. I have the flow-jet carb dialed REAL rich for a cool idle (pum pu-pum pum) like a Harley and max power as well. It will lay a beautifully colored flame under full throttle and load at twilight (with that 5" pipe of mine). Backfires are just as awesome!!! It has been smoking for quite some time. The valve seats are scorched (I wonder why!?!) but it keeps running. I'm trying to locate more on this bike. I'm glad I've kept it. It STILL is a fun thing to ride around on. I've only invested a few sets of chain, a new clutch (gear wears out) and an innertube. On Tuesday, Sept 18th, about sometime after midnight, the storage garage I was renting for housing some personal items was broken into (along with a few other units). Among many other personal posessions stolen was my Mini Trail Rider by Husky. As you can imagine by the pictures, there is very few of this exact bike running around the country, especially since it is NOT original. Unfortunately, I doubt on ever getting this back, and if so, I'm sure it'll have been abused, hacked or bastardized in the meantime, and if so, I wouldn't want it back. It really doesn't carry any personal worth other than I rode it, it still runs and if my sons would ever take an interest in riding it, it's available for their entertainment. I'm more interested on the guilty party involved with the theft. The one thing that was lifted and has the most value to me is a bunch of video tapes that had personal, special events recorded on them (camcorded events...i.e. wedding, birthdays, graduations, etc) and were taken by sheer accident by the guilty party (perhaps thinking they were pre-recorded movies, TOP GUN, TITANIC, etc), and unfortunately their fate may be no better than a toss in the garbage or re-recorded over. 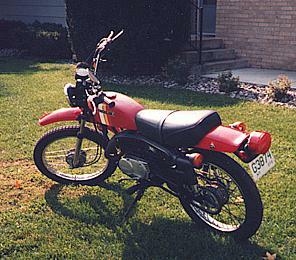 If anyone has any info on possible links to this old mini-bike of MINE, a REWARD would be given for assistance in apprehending the guilty part(ies). Another freebe project I got from a friend. 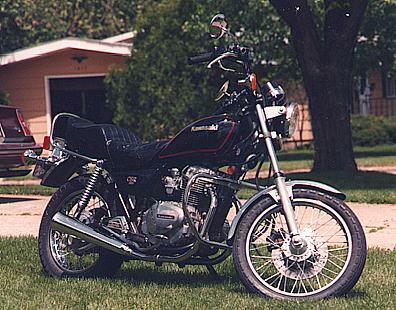 A 1979 Kawasaki KE100, dual purpose cycle. 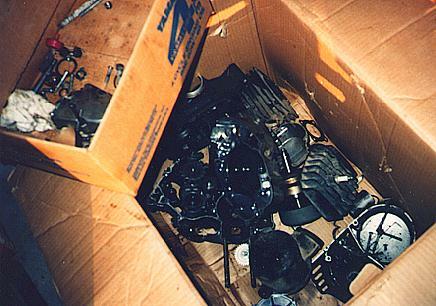 I got it just as you see it, an empty frame and a box full of engine parts. ...all the way down to the reflectors under the tank. 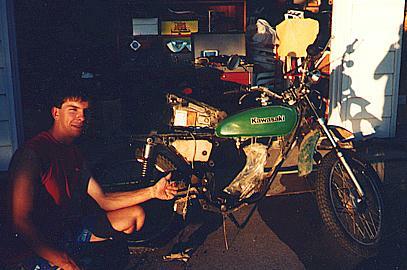 I particularly liked this one because it was painted Kawasaki green and was otherwise in excellent condition. 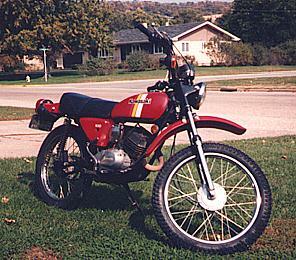 Shown below is a red 1981 KE100. I bought this one a year or two after completion of the '79. The best thing was the red '81 DID have a title. Just like the green '79, I restored this one just as it came off the showroom floor. Unfortunately, there were things not right with this one so I used parts from both to make one good KE100. The finished product was all ready for the road. This is the cycle I got my license with. **It was probably the smallest/most unique cycle ever brought to take the DMV test with. ** If I didn't want to ride a red one, I just switched the green parts with the red ones. 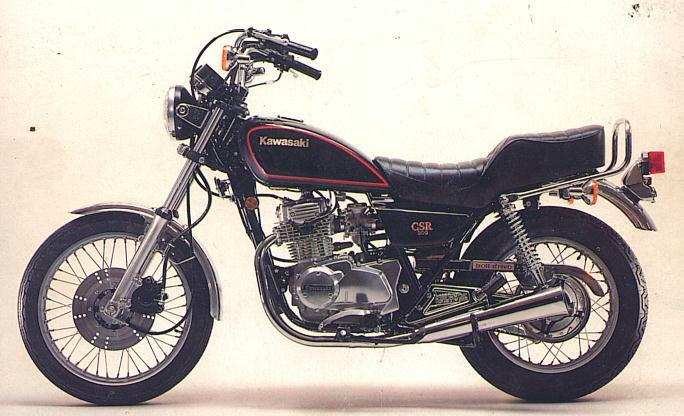 This is a 1981 Kawasaki CSR 305. At the time, I had to sell the two KEs to afford the CSR, not to mention I was running short on storage space. This was a real beauty when I purchased it. The bike only had 6K on it (and the front tire is proof of it too). Compared to the KE, this was a comfy-cruiser. I had wanted a bit more power and comfort to be able to ride long distances. It also performed quite well except for poor cornering clearance. Kind of a neat sound to hear a twin of this size wind well beyond 10K, almost Indy sounding. I rode the heck out of it. And the best part it all, it got 80mpg CONSISTENTLY!!! I am not exaggerating. Now, depending on how I rode it, yes, the mileage did fluctuate. But if I took it easy and let the pistons do the work, it got wonderful mileage. However, as I racked up the miles, and some hard riding, the mileage never did recover. I kept it until a few years ago when I sold it to my father. I purchased my Ascot a year and a half after buying the CSR and owned both at the same time for nearly two years but I licensed the CSR because I wanted to fix up the Honda before riding it. That never happened. I needed to sell the CSR to pay for tires, engine repair, ect. on the Honda. I still get to ride it from time to time. I do miss the little cruiser. I have plans to buy it back off of my father someday.